Herman Cain said today that he was "suspending" his campaign for president. Herman Cain dropped out of the race for president. 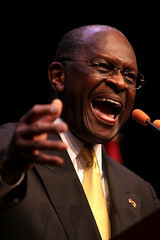 Mr. Cain in a long-winded, self-praising statement said that he was “suspending” his campaign. The end came as a result of allegations of a 13-year affair. His wife Gloria was at the speech today. Herman Cain‘s modus operandi is deny everything first; only after further evidence and details become apparent, then fake bad memory and piecemeal events, blaming everyone but himself. Once again, in today’s press conference we have an opportunity to see Herman Cain’s lack of character on display with some telling details of what kind of dictatorial character Mr. Cain would bring to the White House if he were to get the GOP nod and go on to win in 2012. “I don’t know who this woman is,” Mr. Cain said saying that he had never seen her until last night. His assertion of never knowing or seeing Sharon Bialek prior to her announcement last night may prove his undoing. Referring to Ms. Bialek as a “troubled woman,” Mr. Cain hinted that she and the other accusers, including a new accuser who works for the government, are part of a conspiracy, a “machine” as he put it, to undo his candidacy. Herman Cain’s lack of recall in knowing Sharon Bialek may catch up with him and be his undoing. Last night, with her attorney Gloria Allred at her side, Ms. Bialek described a recent Republican event during which she approached Herman Cain and asked him, “Do you remember me?” According to Ms. Bialek, Mr. Cain responded, “Yes I do.” Mr,. Cain appeared “uncomfortable” and he walked away. At a GOP event, there are sure to be many cell phone cameras and videos along with press footage. There also had to be other people around. If only one of those people or only one piece of footage shows Mr. Cain and Ms. Bialek at this recent event, his campaign is over. Herman Cain‘s smoking ad is no surprise given his indebtedness to the tobacco industry who has supported him for over a decade. But the tobacco ad is just the tip of what is becoming a campaign of offensiveness for Mr. Cain: a campaign that promotes the basest of behavior and a campaign that caters to the liquor industry as well as big tobacco, both of which he lobbied hard for in Washington to end regulations. By now, you’ve probably seen the smoking ad (if you’ve somehow missed it, here’s the link). The ad is paid for by Friends of Herman Cain. Mark Block, who is Mr. Cain’s chief of staff, is featured puffing a cigarette in the ad, and coincidentally the CEO of, you guessed it Friends of Herman Cain! If you were offended by this smoking ad, I warn you that it only gets worse. An ad produced and paid for by in August by Friends of Herman Cain takes offensiveness to new heights. And it’s weird too. Titled “He Carried Yellow Flowers” the ad features an actor on a movie set. 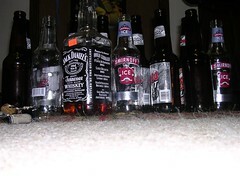 The boozing and fighting are all supposed to be part of the western he’s filming (yeah right, as if we believe that!) but it’s what happens after the “director” yells “cut.” Watch how this actor, now supposed out of character, treats the women on the set including the female p.a. The New York Times on Sunday, in an article, detailed the involvement Herman Cain has with both the tobacco industry and liquor makers from his days in Washington as a lobbyist (after he left the pizza business). As the head of a lobbying group for restaurant owners, Mr. Cain fought lawmakers to end smoking regulations and against regulations to curb drunk driving. Big- tobacco giant R. J. Reynolds paid Mr. Cain’s group “handsomely,” according to the New York Times. An official at that company says “that Mr. Cain’s presidential ‘were not unexpected,'” according to the New York Times article on Sunday. By the way, Herman Cain also was a board member for Nabisco which is a part of R. J. Reynolds. Herman Cain is still leading in the GOP polls. Only time will tell if these latest ads will prove even too shocking for the party base. By the way, if you’re wondering about the song in the smoking ad, here’s the info: “I Am American” is by Krista Branch.